A Krups waffle iron is a handy tool to have in your kitchen if you like your waffles hot and fresh. 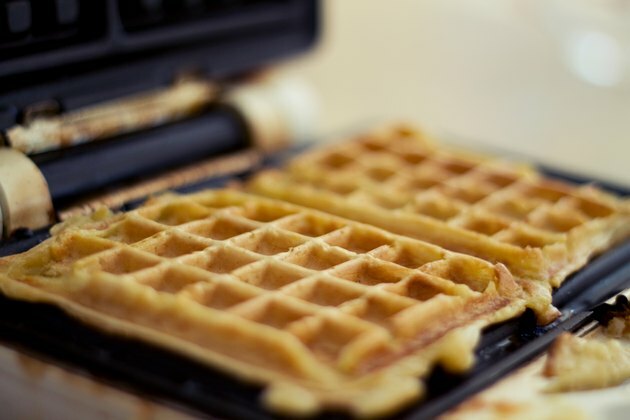 Whether you use an official Krups waffle maker recipe for your batter or have some other preference, knowing how to properly cook the waffles will keep you from overcooking (or undercooking) them. If you can't find the user's manual for your waffle maker, you're in luck – while Krups manufactures a few different waffle irons, the different models still function more or less the same. Knowing how to make waffles with one Krups iron will help you figure out the process for all of them. Whether it's the first time you've used your Krups waffle iron or the thousandth, make sure that you clean the nonstick metal plates before you start cooking. Wipe the plates with a damp sponge, using no soap when you clean them. Once you've wiped the plates down, dry them with a clean, dry towel. After cleaning, grease the plates with butter or a pan spray to add flavor while protecting the nonstick coating on the cooking plates. After you've greased the plates, close your waffle iron and engage the latch that holds it closed until it clicks into place. Plug the waffle iron in – you'll see the lights on the unit turn on to indicate that it has power. Leave the waffle iron alone for a few minutes as it begins heating up. If you notice a smell while the waffle iron heats up, it's simply some of the excess butter or pan spray burning off. While the Krups waffle iron heats up, prepare your waffle batter and whisk it thoroughly to make it as light and fluffy as possible. Don't try to put any batter into the waffle iron yet, though; wait until the "Ready" light on the waffle maker turns off indicating that it has reached proper cooking temperature. When it does, open the unit and carefully ladle or pour in enough batter to barely fill the plates. Close the lid carefully, leaving the latch undone to allow the lid to shift as the waffles cook and expand. According to the Krups waffle maker manual, the cooking time for waffles on one of the company's waffle irons is 4 to 6 minutes. The type of batter used and your preferred crispness can affect this cooking time, however, so Krups recommends trying different times and monitoring doneness to get your waffles just the way you want them. Once the waffles are cooked, open the lid and use wooden or plastic (not metal) utensils to remove the waffles from the iron. You can make more waffles while it's hot or unplug the waffle maker and allow it to cool before cleaning it and putting it away.